The simplest way to measure the temperature withing the range of naturally occurring values is to use the digital sensor DS18B20. It can be, within a short distance, connected directly to the microprocessor, as shown in the following picture. A closer look at the connection. The blue cable represents GND, the red one Vcc and the yellow one is DATA. The wires used are made of 1m long connection cables that are cut in a half. It must not be forgotten, to connect a pull-up resistor to the processor's data cable. It will ensure, that the default state of the data link is logical high. A suitable resistance is for example 10kOhm. This value is available for CPU modules and has been proved working. Manufacturer, somewhat more skeptically, recommends 4kOhm instead. A pressure can be measured with an external analog sensor, like MPX5100AP. A verified solution consist in connecting the C3088 camera, that uses the OV6620 single-chip. 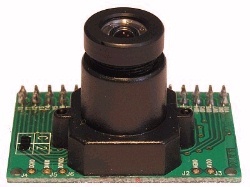 The camera has a disadvantage in using a simple, but outdated parallel interface, that operates with 5V CMOS logic. It thus limits its connectability to modern, fast components like FPGAs or processors as presently, the 5V tolerable inputs gradually diminish among these devices. An alternative to this camera would probably involve using some more modern camera (eg. one from a cell phone) with a serial interface for instance with LVDS logic.